We are proud to welcome David Herpich back to Earth Mantra with his latest Emerald Adrift release, a graceful and intriguing album called Evening Hush. We have long considered David to be one of the most talented artists we know, given his astounding fusion of deep academic knowledge with absolutely incomparable taste and artistic vision. He is one of those rare individuals who feels the music intuitively, who can express unbridled passion in his compositions, and yet his music is more than technically challenging enough to satisfy any purist. And with his latest offering, a collection of indescribable keyboard compositions of immense beauty, he reminds us again of why we hold his gifts in such high regard. "The tracks are introspective. They are of epic length, but focused on the internal, and on interaction between individuals. "There was no attempt at a genre. The music was not designed to be ambient or new age or classical. Instead, it was an intuitive mix of influences." We would wholeheartedly agree that this music is difficult to categorize. David's pace is wonderfully slow, patiently allowing the music to develop organically of its own accord. Thus, it could be described as ambient; but this would be a gross oversimplification, for there are also elements of classical composition, of soothing new age sensibility, and an unclassifiable something that we just cannot put our finger on. But whatever one calls this music, one also has to call it magnificent. David has always been a boundary pusher, and this album is no exception. He continues to make refreshingly novel music and explore brand new forms, while at the same time producing songs that are instantly approachable and enduringly satisfying. Magic like his does not come along often, folks. 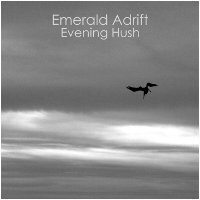 We are very proud to bring our listeners Evening Hush, the second Emerald Adrift album on Earth Mantra, and we hope to hear much more from this supremely talented artist in the future. Hi - I am certainly happy to discove this. Good job! This album features nice piano and keyboard pieces that remind me of the classical impressionist music of Ravel, Debussy, and Satie. Altough, at times the music becomes drift-like ambient and even incorporates a cello. The whole album has a nostalgic, melancholic, and introspective jazzy-mood. To me it is "rainy-day" type of music, when the sky is grey,...so the album-cover really fits the music.